Vital capacity (VC) is the maximum amount of air that can be inhaled or exhaled from the lung. It is one of the measurements taken during spirometry or pulmonary function testing. VC is measured using a spirometer. Your vital capacity will differ according to your age, gender, height, mass, and ethnicity. This means that normal for a short 36-year-old white female of normal weight will expect to have a different vital capacity from a tall, overweight, 60-year-old Hispanic male. However, the range of vital capacity for an adult is 3-5 liters. Depending on the disease, vital capacity will be impacted differently. Asthma is termed an obstructive lung disease because the narrowing airways make it difficult to get air out of the lungs. In an obstructive lung disease, vital capacity may be normal or only slightly decreased. In restrictive lung diseases, the lungs lose some of their ability to expand and contract and you see resulting smaller lung volumes. You will see decreased lung volumes after radiation treatment of the lungs for certain cancer treatments and other diseases that directly damage or infiltrate the lungs. There is an adage that is most often discussed in business that very much applies to chronic diseases like asthma. The general gist of the saying is that without regular measurement, you cannot change outcomes. So if you want to improve your asthma control, you will need to perform regular measurement of your asthma and then make changes based on those measurements. The asthma guidelines recommend you monitor either symptoms or some objective measure. While performing home spirometry could get you a regular measurement of your vital capacity, you probably do not need to go to that extreme. Peak flows on a regular basis should be enough for your asthma action plan. 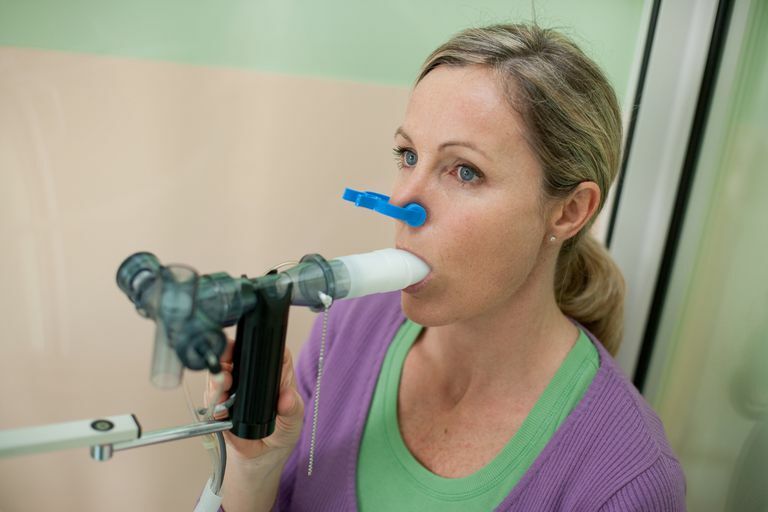 Spirometry is one of the most commonly performed pulmonary function tests when you have asthma and technology that now allows many patients to have some sort of measurement of vital capacity and other measures of pulmonary function. When you inhale and exhale into the mouthpiece of a spirometer, it measures airflow. Forced Vital Capacity (FVC): The maximum amount of air that you can forcefully breathe out after breathing in as much air as you can. Forced Expiratory Volume at One Second or FEV1: The amount of air you forcefully exhale at one second after starting to exhale. This test is decreased in asthma patients with poor control. Your doctor will do a number of things to make sure that the numbers being measured by the device are correct. Generally, your doctor's office can use a 3-liter syringe to simulate breathing. Your doctor's office can then compare the numbers using the syringe compared to the manufacturer's numbers. If the numbers are off by more than 3%, your doctor needs to have the machine checked. Your doctor's office should also be using a device to measure your height and weight as these are used in the calculations by the machine. For height, the recommended device is a stadiometer rather than relying on what you think your height is. Likewise, an appropriate scale should be used to check weight. You will usually be seated during the procedure and you may be offered nose clips to prevent air from leaking out. Your doctor wants all of the air to come out through your mouth. You will be asked to take a deep breathe in and place the mouth device into your mouth forming a tight seal. You will seal your lips tightly around the mouthpiece to prevent any leakage of air during your forceful exhalation. The goal is to have an exhalation that lasts at least 6 seconds. Your doctor will have you repeat the test at least 3 times — you will be allowed to rest in between attempts. Your doctor is looking for multiple attempts that produce a similar result indicating that you were consistent across each effort. The technician performing the test will often act as a coach. One of the technician's goals is to obtain maximal, reproducible efforts from you. They will often verbally guide you through taking a number of deep breaths and then you will hear them raise their voice loudly instructing you to blast out the air and encourage you to continue exhaling for as long as possible. Brack T, Jubran A, Tobin MJ. Dyspnea and Decreased Variability of Breathing in Patients With Restrictive Lung Disease. Am. J. Respir. Crit. Care Med 2002. 165 (9): 1260–4. Clinical Pulmonary Function Testing, Exercise Testing, and Disability Evaluation. In Chest Medicine: Essentials Of Pulmonary And Critical Care Medicine. Editors: Ronald B. George, Richard W. Light, Richard A. Matthay, Michael A. Matthay. May 2005, 5th edition. Johns Hopkins School of Medicine Interactive Respiratory Medicine. Restrictive Ventilatory Defect.